For record keeping of all required testing and maintenance, giving a consistent and compliant method of gathering evidence for audit. Includes test explanations, guides and Isopharm Tips throughout. Provides daily, weekly, quarterly and annual test sheets for a single washer disinfector over 12 months. With explanations, guides and Isopharm Tips throughout. Presented in an understandable format with Isopharm Tips throughout. 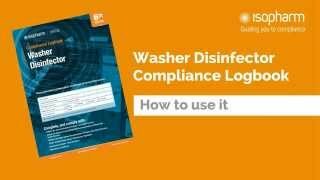 Detailed guidance and flowcharts are now included in the Washer Disinfector logbook. A full year of record keeping is provided. Get non-verifiable CPD from your Isopharm logbook! Our logbook has a non-verifiable record sheet at the back that poses a set of questions about the guidance sections within. The supplied document is © Copyright Isopharm Limited and may not be reproduced without the express permission of Isopharm Limited. Due to the nature of the product this is a non-refundable item once purchased. The Disinfection Process, what it is and when it is performed in the decontamination cycle. Washer Disinfector Testing & Validation, including what tests are required and who should carry them out. Hand Hygiene and how to perform it. Personal Protective Equipment including the order of placement and removal. Instrument Inspection with a how-to guide and process flowchart. Pouches, Trays & Transport, providing detailed information on the transport and storage of instruments. A two page spread of our popular Decontamination Flow Chart is also included, providing easy to follow guidance for the flow for instruments from preparation to storage. Isopharm logbooks help to create a compliance system, providing essential guidance and peace of mind for your practice.